Since moving to Nashville in 1983, Music Row has allowed J. FRED KNOBLOCH to make lots of "noise with the boys" as an artist, session musician and songwriter. With his good friends Thom Schuyler and Craig Brickhardt, he formed the group SKB, whose hits include No East Horses and #1 Country single Baby's Got A New Baby. Fred's songs have been cut by Lorrie Morgan, John Anderson, Tricia Yearwood, Faith Hill, George Strait, Larry Stewart, Neal McCoy, Confederate Railroad, Sawyer Brown, Delbert McClinton, Etta James, Ray Charles, Nitty Gritty Dirt Band and Kenny Rogers. KIRK JELLYROLL JOHNSON'S distinctive, soulful style of harmonica has earned him a place as one of Nashville's top session musicians. Since moving to Nashville in 1984, he has recorded with Tricia Yearwood, Kathy Mattea, Etta James, Beth Nielson Chapman, Randy Travis, The Judds, Shania Twain and many others. His unique sound has been heard on over 50 gold and platinum albums. 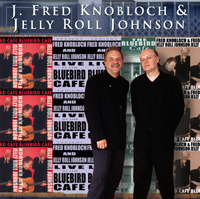 Here's a magical evening of J. FRED KNOBLOCH & JELLY ROLL JOHNSON LIVE AT THE BLUEBIRD. American Originals Records also offers JELLYROLL JOHNSON & A FEW CLOSE FRIENDS (AMO-3004). For that album, click on the "American Originals" button on the left side of this page.